Watashi no Tomodachi ga Motenai no wa Dou Kangaetemo Omaera ga Warui. The protagonist of Watamote. She's bad at talking with people, nonetheless she wants to have friends and even a boyfriend. 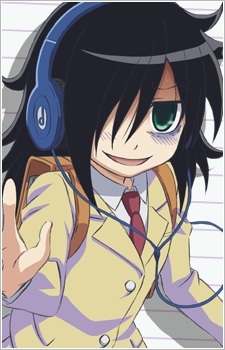 Unfortunately, her appearance, shyness, social anxiety, and lack of experience in communicating with everyone but her own family doesn't really help Tomoko make things better. She finds entering high school as an opportunity to change her life and make a lot of friends, so she keeps trying to do everything to gain attention of her new classmates. To no avail because she doesn't follow through with her plans and would often end up procrastinating. Whether they always look like they're about to cry, are perpetually sobbing, or have to struggle with feelings of depression on a daily basis, these are the top 10 sad gals of anime.